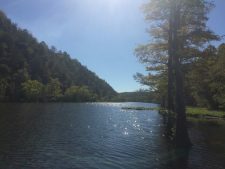 In Southeastern Oklahoma just a couple of hours from Dallas, Texas, or Oklahoma City, Oklahoma, just off of US 259 and US 259A, lies a hidden gem for outdoor-loving couples. This little getaway has in recent years began booming as a premier, cutting edge vacation destination and travel savvy couples are coming from all parts of the country to see what the stir is all about. In fact, this beautiful, nationally acclaimed vacation mecca even draws outdoor loving couples from around the world and for all four seasons. Many folks book cabins up to a year in advance to celebrate the holidays at such a special place. Canoeing, kayaking, hiking, fly-fishing, lake fishing, paddle boats, speed boats, water skiing, miniature golf, river floats, train rides, hay rides, horseback riding, golf, scuba diving, hunting, four-wheeling, archery, mountain biking, jet skiing, wine tasting, camping, cabins, resorts, museums, festivals, breweries, National Forests, wilderness, nature centers, birding, tennis, swimming, tubing, sailing, the recreational possibilities are absolutely endless and as long as you enjoy the great outdoors, it’s certain that every member will find plenty to do. The only pre-requisite is a thirst for adventure in nature and the great outdoors. With so much to offer, don’t forget to schedule a little time to bask in doing nothing as the views and tranquility are astounding. In autumn the leaves are ablaze with breathtaking color that draws visitors from all states, springtime brings wildflowers, swift trout streams, and rivers burgeoning with wildlife. Summer days beckon to visitors who delight in Broken Bow Lake and Beaver’s Bend State Park for all water related activities, sports, and pastimes. Winter is such a popular time that the cabins in Hochatown, and the lodging in the entire area are often at full capacity and reserved months in advance as the picturesque area provides the perfect back drop to create magical holiday memories. Once you arrive, you will want to orient yourselves by stopping in any of the visitor centers for some maps and information. There are some excellent maps that will guide you throughout the area and help you to plan hikes and excursions accordingly. Some of the hikes are strenuous so ask for assistance in planning and be certain to wear proper footwear, bring water, snacks, and sunscreen or hat. There are some steep elevation changes, throughout the area, but the vistas are absolutely awe-inspiring as you traverse rugged cliffs and gorges above rushing streams and rivers and through forests and meadows. Lodging is reasonably priced compared to many other comparable destinations, and there are many various lodging options from resort lodges to private cabins, bed and breakfasts, tepees, and camp sites both primitive and with all the amenities and hook-ups. But do plan ahead as this destination is growing by leaps and bounds and as the secret gets out it is becoming more and more important to plan ahead even during what would seem to be the off-season at most locales. The Beaver’s Bend Marina on Broken Bow Lake, is your one-stop shop for all boating and water sport related fun. 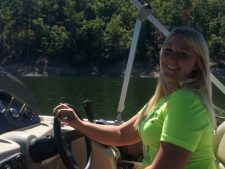 The warm and friendly staff there will gladly assist you in rentals, information, and everything needed to enjoy Broken Bow Lake to its fullest. This lake boasts some of the purest water of any lake in the nation with visibility of over six feet in depth. You may want to rent a houseboat and explore hidden coves, or create your own private party atop a rented pontoon boat. You might choose to rent Jet skis and dump some adrenaline. And if you like fishing then this is the place for you. Bass, walleye, crappie, and trout are plentiful. The Marina even offers a dockside store with tackle, bait, lures, and everything you could possibly need to make your lake adventure complete. 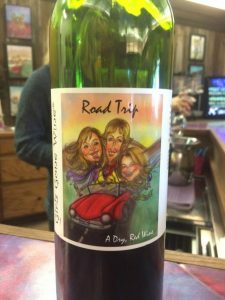 Girls Gone Wine is a must stop, unique adventure with a boutique, winery, gift shop, and more. You’ll want to take a peek and learn a little about how it was founded by some local moms and what they do to support their community. There are several dining options but one favorite is Grateful Head Pizza in Hochatown serving delicious homemade pizza and providing the perfect ambiance to sit out on the deck after a long day on the water, to refuel and recharge. They often have live music to add to the fun. Museums are big at Broken Bow with three to choose from and they offer a fun way to immerse yourself in the culture and history of the region. Native American and Pioneer artifacts, wildlife and environmental education, along with logging heritage and history, are just some of the things that will captivate the visitor of any age or generation. You may want to plan your trip around one of the many events, festivals, or tournaments that only add to the annual fun of the area. There are fishing tournaments, art shows, rodeos, golf tournaments, gem and mineral shows, folk festivals, craft fairs, parades, and holiday festivities peppered throughout the year, only adding to the already endless reasons to plan a visit any time of year. You may hear a lot about Lake Tahoe, Crater Lake, Big Bear Lake, Lake Placid, Lake Havasu, Coeur d’Alene, or Lake of the Ozarks, but you will be hearing a lot more about Broken Bow as this best kept secret spreads. Right now you can blaze your own trail, and create some lasting memories at Broken Bow where travel legacies are just beginning and you can lead the way in up and coming outdoor family travel at its very best.